My daughter will be four (gasp! ), four years old in just a few weeks. Parents say this all the time, but seriously, where did the time go? I swear it seems like she was just a wee babe cuddling in my arms not too long ago. But no, we haven’t fallen into some wormhole tunnelling us unexpectedly into the future. It just feels like it is all. And while Sweet Girl’s growth and development is an awesome thing to observe and experience, giving up nap time is bittersweet. A few months ago she started to be hit and miss with the naps. It began with weekend naps. The way she would fight nap time, you’d think we were forcing her to eat broccoli stew or something (Sandra Boynton shout out right there). Then we’d go back to a regular nap schedule…shorter naps but still, napping everyday. And then, the nap time protest started up again. A nap slipped into a day here and there until eventually it came to a point where we – in partnership with her care provider – said you know what, she’s basically done. But I miss nap time! For a couple of reasons. First, it’s nap time! We often would all go down for a nap when Sweet Girl did. Plus ya, even if I didn’t nap I’d use the time to get things done. Like laundry. Or mopping the floor. Or finishing some other equally lame but-needs-to-be-done household chore. And yet, it reaches a point where your kid is staying up later and later and napping less and less and you just have to say – ya, she’s done. One week in living the nap free life and the transition has been fairly smooth. Sure she’s cranky come the end of the day but that crankiness isn’t an everyday thing. And skipping nap time also means an earlier bedtime for my girl, which means more time for me to read, write and hangout with my husband. But what I love is that it also means we can go do a lot of fun things in the afternoon that previously needed to scheduled around said naps. Like go swimming at the local City of Ottawa outdoor pool (seriously, City of Ottawa outdoor pools are awesome). Or hit the library or visit with friends, etc. I know she’s not completely done with naps yet. Because somedays, she falls asleep unexpectedly. 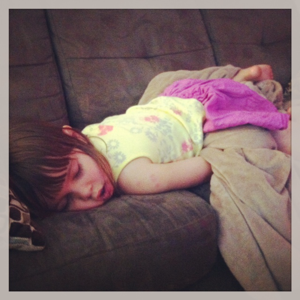 And the sound of her slow, steady breathing and look of her face in peaceful rest…it melts me. She’s growing up. But there’s no rush. No rush at all. My daughter stopped napping when she was about a year old, so I read this post with little or no sympathy. Amy recently posted..Summer of awesome? LOL. Okay, Amy. Very good point. Brandon still relies on his naps. It’s unreal. But he’s been doing that hit and miss thing for over a year now. His sleep in general isn’t as good as it used to be, so I would love for him to totally give them up so he’d at least sleep better at night. But he continues to be the first one out during rest time at daycare. Crazy. Also, he’s 5, so really…it’s time for the nap to go. Do you have a strategy to wean Brandon off of his naps or are you letting him self-wean? I totally get this post – the fixed down time in the afternoon was so nice – but I actually think it’s been better since nap times ended. The first summer that our youngest didn’t nap was our first Summer of Awesome – finally we could take day trips and head out and see so much more of the city. Combined with toilet training, there was so much more freedom to explore and enjoy the summer. It’ll be great – promise!